Johnson Precision was founded in 1976 with a single mission: To meet the CNC machining technology demands of the aerospace industry. 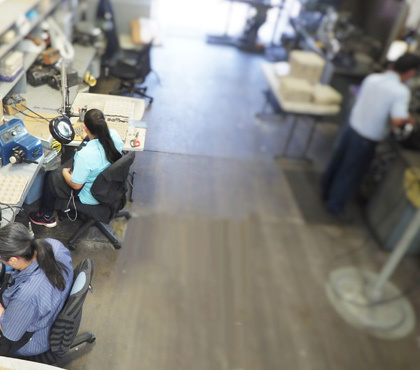 Since then, Johnson Precision has developed and maintained a highly experienced staff and positioned itself as a trusted provider of components in the aerospace industry. Johnson Precision was acquired by Paul Cronin,. in 2005. Paul Cronin Brings to Johnson Precision a highly respected reputation and a lifetime of experience in the aerospace manufacturing business. Paul's leadership skills combined with Johnson's talented and proven team makes for an exciting combination ready to meet the challenging demands of today's aerospace manufacturing industry. We specialize in the machining of a full range of metals including titanium and alloy steels. Our 12,000 sq ft facility houses 3, 4 and 5 Axis CNC machining centers and next level assembly capability. We pride ourselves on our ability to maintain a small business atmosphere that offers superior customer service, flexibility and short lead times while having the expertise to machine intricate complex parts to the highest quality standards. Johnson Precision is ISO 9001:2000 / AS9100 certified. © 2016 Johnson Precision Products, Inc.